Biodiesel may be produced in small quantities for individual use or in larger quantities for commercial purposes. For smaller producers, biodiesel can be produced with readily available production equipment in batches of 15 to 400 gallons. Commercial scale production of biodiesel may utilize continuous flow production equipment with annual capacities in excess of one million gallons. The technical feasibility of producing biodiesel in both small and large quantities creates the potential for biodiesel to be produced in scales appropriate to feedstock availability and consumer demand. These proportions may be adjusted for differences in the chemical composition of the oils and fats to be processed, the type and purity of the alcohol used, and the technology employed to facilitate the reaction. nature of the process may tempt producers to overlook important process details. filtered to remove particles and dried to reduce water content. Virgin oil needs to be degummed during the pretreatment process.2 Once the oil has been pretreated, a titration test is performed.3 The results of the titration test are used to adjust the amount of catalyst required to successfully complete the transesterification process. Step 2: The next step is to mix a catalyst into an alcohol. If sodium hydroxide and methanol are used, the resulting mixture is referred to as sodium methoxide. The catalyst, alcohol, and mixture are all hazardous materials that should be properly handled. The catalyst and alcohol mixture is combined with oil to facilitate transesterification. In some cases the catalyst, oil, and alcohol are heated prior to, or during, or both prior to and during transesterification. Adding heat shortens the time required for processing and may increase the overall reaction rate. the biodiesel and glycerin. Although glycerin tends to contain a higher percentage of contaminants, significant amounts of contaminants may also be present in the biodiesel. scale producers to recover the excess methanol. One method of removing contaminates from biodiesel is to wash the fuel with water.4 Washing is accomplished by misting water over biodiesel or by bubbling water through it. The water droplets collect contaminates as they descend through the fuel. Finally, biodiesel is dried and filtered and the production process is complete. Producers of biodiesel must decide what types of oil, catalyst, and alcohol they will use in their operation. The quality of oil used to produce biodiesel affects several aspects of the production process. If recycled oil is used, several additional steps are needed to ensure successful biodiesel production. First, the oil must be filtered to remove any solid contaminants such as bone and other food particles. Second, the oil’s free fatty acid level and water content should be measured. have probably already been degummed. The consistency and low contamination levels of virgin oils make them ideal for biodiesel production, but typically they cost more than lower quality recycled oils. A successful biodiesel producer has to obtain a reliable source of oil, regardless whether the oil is virgin or recycled. Recycled oils are usually obtained from local restaurants and food processors, often at a low cost.5 Virgin oil can be obtained by processing oilseeds (such as canola, soybeans, safflower, camelina, flax, etc.) with small scale processing equipment or purchased from a commercial oilseed processing facility. Price and availability are key factors in determining which alcohol to use in the production process. Ethanol and methanol are the two most common options. High quality methanol is often cheaper and more readily available than non-denatured ethanol and, therefore, is used in nearly all biodiesel operations. Methanol can be obtained in quantities of 5 gallons or more from many bulk fuel distributors and from distributors of racing fuel. The price of methanol can vary substantially depending on the quantity purchased. The cost of methanol represents a relatively large component of total cost of producing biodiesel.6 It also important to be aware of safety concerns when handling methanol or ethanol. Both are highly flammable and require careful handling to ensure a safe working environment. How many gallons can be processed per batch? How long does each batch take to process? Is the system capable of heating the oil and/or the alcohol-catalyst mixture? Does the system include methanol recovery equipment? Does the system have the capability to wash and dry the biodiesel? Does the system require extra plumbing, fittings or pumps? Does the manufacture provide technical support? Does the system require that a specific catalyst be used? Does the quoted price of the system include shipping costs? 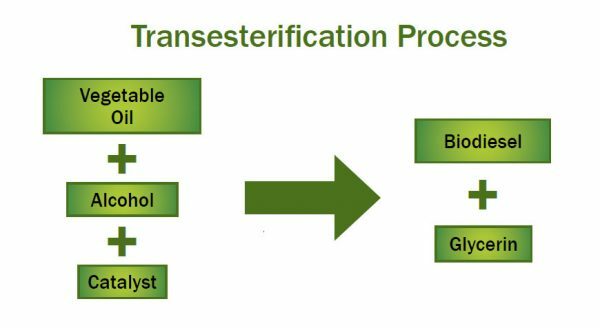 The transesterification process produces two products, biodiesel and glycerin. Biodiesel quality depends on the inputs and processing techniques used in its production. The American Society for Testing and Materials (ASTM) has developed quality standards for biodiesel. Unfortunately for small scale producers, the cost of testing a batch of biodiesel is likely to exceed the value of the fuel produced. Fuel that has not been tested for ASTM standards generally cannot be marketed on a commercial basis. Most small scale producers will be limited to producing biodiesel for personal use. Lack of ASTM testing does not necessarily imply that fuel quality is poor. Small scale producers must focus on accurate processing procedures to ensure fuel quality. These steps may include proper filtering, accurate catalyst measurement and fuel washing procedures. Glycerin produced during the biodiesel process is crude and unrefined. Numerous markets are available for refined glycerin, but these markets are not generally available to small producers because of the cost of glycerin refining. Crude glycerin produced in small scale biodiesel operations typically contains unreacted oil, catalyst, methanol (if not recovered during processing) and some biodiesel. Glycerin and biodiesel are generally considered as environmentally friendly, but the catalyst and methanol contained in crude glycerin are not. Thus, a producer’s alternatives for disposing of crude glycerin may be limited. One option is to use the crude glycerin as fuel oil. Another is to compost it. Large volumes of liquid glycerin are produced in the biodiesel process (10% to 15% of biodiesel production) and adequate planning is required for successful composting. Some biodiesel producers also use glycerin as a dust suppressant or for soap making. biodiesel but also offer incentives for biodiesel production. Van_Gerpen, J., R. Pruszko, D. Clements, B. Shanks and G. Knothe (2006). Building a Successful Biodiesel Business. 1 Some methods of producing biodiesel are not examined here. Those interested in a more detailed discussion of biodiesel production technology may want to read “Building a Successful Biodiesel Business” by Jon Van Gerpen, Rudy Pruszko, Davis Clements, Brent Shanks and Gerhard Knothe. 2 Degumming oil removes waxes, phosphates and other impurities in the oil. 3 A titration test measures several characteristics of the oil. Titration test results are used to adjust process parameters to ensure fuel of sufficiently high quality is produced. 5 Permission should be obtained from the restaurant or food processor prior to collecting any used oil because they may already have an agreement in place for the disposal of their used oil. 6 The production of biodiesel requires between 10 to 20 gallons of methanol for each 100 gallons of biodiesel produced. If methanol is purchased for $2.00 per gallon, each gallon of biodiesel produced will contain $0.20 to $0.40 of methanol. 7 Many equipment manufacturers recommend catalysts appropriate for use with their specific equipment.